ALL NEW ROCKWOOD SERIES FOR 2019. THE ROCKWOOD EXTREME SPORTS PACKAGE ESP IS DESIGNED FOR THE ACTIVE FAMILY WHO EMBRACE THE MANY OUTDOOR ACTIVITIES THAT ARE POPULAR TODAY. UNIT FEATURES THE PRO RACK ROOF RACK SYSTEM THAT ALLOWS YOU TO ATTACH BIKES, CANOE'S OR KAYAK'S. THE 232 ESP ALLOWS YOU TO CARRY A QUAD OR MOTORCYCLE OFF THE FRONT CARRIER AS WELL. 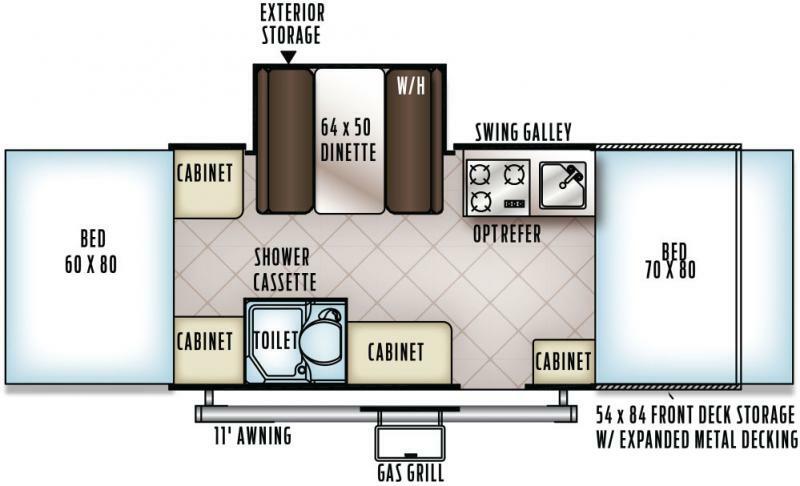 FLOOR PLAN FEATURES A SLIDE OUT DINETTE WITH BOTH FRONT AND REAR PULL OUT BEDS AND A SHOWER WITH CASSETTE TOILET. THE OVER SIZED TIRES INCLUDE UPGRADE ALUMINUM WHEELS AND THE OFF ROAD GREY AND BLACK EXTERIOR GIVE THIS SERIES THE RUGGED OFF ROAD LOOK. OPTIONS INCLUDE POWER LIFT SYSTEM, 3-WAY FRIDGE, FURNACE, LED LIGHTING, AWNING, DIGITAL MEDIA CENTER WITH BLUE TOOTH AND A MP3 PLAYER, WIFI RANGER, GAS GRILL, HOT WATER HEATER WITH CASSETTE TOILET AND SHOWER, DOUBLE GAS BOTTLES AND MUCH MORE. THIS IS A SPECIAL INTERNET PRICE AND IS DISCOUNTED FOR THIS SALE.